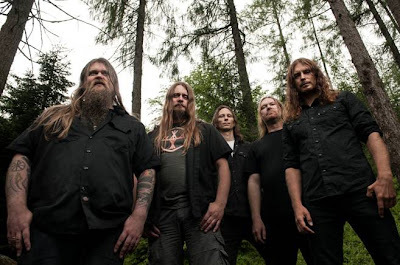 Norwegian progressive extreme metal band ENSLAVED will return to the U.S. and Canada in early 2013 for a headlining, 20-show “Winter Rite” tour joined by U.S. doom metallers Pallbearer and occult rockers Ancient VVisdom as openers. Kick-off is in Philadelphia on January 30th with the tour closing in New York City on February 22nd. RIITIIR, ENSLAVED’s twelfth studio album, debuted at #8 on the Billboard Heatseekers chart in October with the band’s highest first-week sales in their career in the United States. The album is already a contender for many “Best of” year-end lists around the world for 2012. Pick up a copy at the Nuclear Blast Webshop, iTunes, or Amazon and see why that is. ENSLAVED will be headlining Scion A/V’s Roadburn Records showcase on Saturday, November 10th, 2012 at The Roxy in West Hollywood. Also performing are White Hills, Scott Kelly, Earthless, and Astra. Do a little visual meditation with the “Thoughts Like Hammers” video on YouTube.